The 2016 PBA Commissioner’s Cup elims ended with a pair of great games tonight. In the opener, the Alaska Aces flew past the NLEX Road Warriors to get 3rd place in the standings, while the San Miguel Beermen rallied to defeat Tropang TNT in the nightcap to snare the top spot from the Meralco Bolts. The Alaska Aces recovered from a huge collapse to beat the NLEX Road Warriors, 104-98, in the Oppo PBA Commissioner’s Cup Friday at SMART-Araneta Coliseum. Alaska improved to 7-4 and settled for the No.3 seed. They will figure in a best-of-three quarterfinal series with Tropang TNT and avoided a nightmare scenario of sliding all the way down to No.7 where they would have faced a twice-to-win situation. 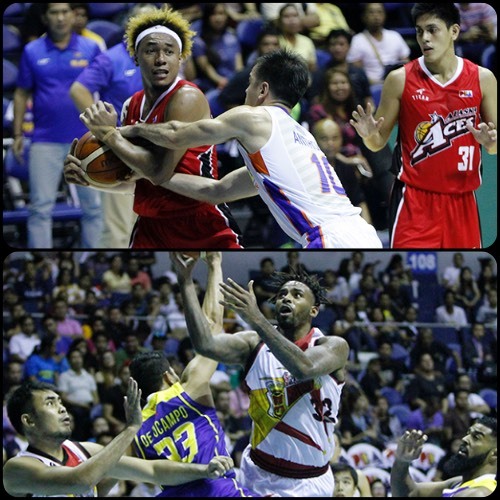 Calvin Abueva delivered 23 points and eight rebounds to lead the Aces, who squandered a 20-point cushion in the first quarter. Sonny Thoss made 19 points and eight boards, while RJ Jazul delivered big buckets down the stretch en route to 18 markers. Rob Dozier, Alaska’s original import choice, finally played his first game after a long layoff due to injury. He scored 14 points and had 13 boards. Al Thornton top-scored for NLEX, which is locked at No.7, with 37 points. Sean Anthony chipped in 24 markers. The Road Warriors will face sister team Meralco in the quarterfinals. The San Miguel Beermen overcame a double-digit deficit in the fourth quarter to down Tropang TNT, 104-98, and clinch the No.1 spot on the last day of the Oppo PBA Commissioner’s Cup elimination round Friday at SMART-Araneta Coliseum. The victory propelled the Beermen (8-3) to the top of the team standings and handed them a twice-to-beat advantage in the quarterfinals against No.8 seed Star Hotshots. Tyler Wilkerson maintained his explosive form, scoring 36 points and 15 rebounds. June Mar Fajardo also delivered with 18 points and seven boards. More importantly, the two sparked a Beermen rally in the fourth quarter where they trailed by as many as 10 points. David Simon tallied 32 points and 16 rebounds for TNT, which fell to the sixth spot and set up a best-of-three quarterfinal match against Alaska.